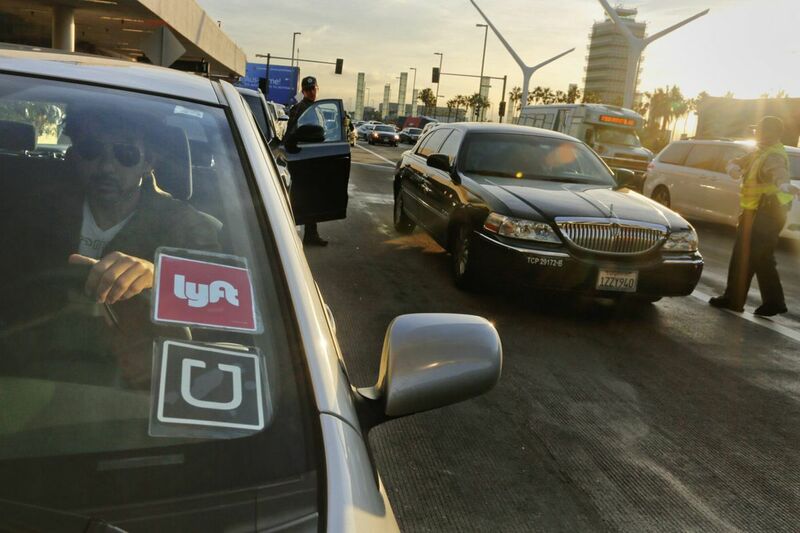 The Philly connection to the Uber and Lyft drivers’ strike in L.A.
A driver for Uber and Lyft in Los Angeles. Hundreds of drivers are on strike in Los Angeles, protesting a 25-percent cut to their pay per mile. Hundreds of Uber and Lyft drivers in Los Angeles went on strike at 12:01 a.m. Monday, shutting off their apps for 25 hours to protest Uber’s recent 25 percent cut in per-mile pay in their area. The critical tool that helped get their movement started? Facebook ads, funded in part by a Philadelphia organization, the Media, Inequality, and Change Center. In October, Rideshare Drivers United, the Los Angeles group fighting for Uber and Lyft drivers’ rights that organized the strike, bought a series of Facebook ads targeting Uber and Lyft drivers, said Brian Dolber, a professor of communications at California State University-San Marcos. Dolber, a former ride-share driver who helped organize Rideshare Drivers United, spoke at a conference Monday in Philadelphia about the on-demand platform economy organized by the Penn/Rutgers Media, Inequality, and Change Center. The center focuses on the intersections of democracy, technology, policy, and social justice. A software developer working with Rideshare Drivers United was initially funding the Facebook ads out of his own pocket but, Dolber said, with the grant from the Media, Inequality, and Change Center, the group was able to start running more ads and grow its membership. The ads solved a major challenge for organizing gig workers, whether it’s domestic workers, ride-share drivers, or couriers: How do you find them? It’s not like a traditional model, where organizers can go to one workplace and find employees. But Facebook has sophisticated ways of targeting certain kinds of users, such as ride-share drivers, even if they’re not listing “Uber driver” as their occupation. The Facebook ads drove them to Rideshare Drivers United’s site, where both drivers and non-drivers who supported the issue could sign up with their phone number to get texts and phone calls from the organization. Ride Share Drivers United would then call drivers, talk to them about their working conditions, and get them to take action. Dolber said $0.66 was spent per conversion, or per person who signed up to join the group. The ads were financed in part by the Media, Inequality and Change Center, which gave out grants to researchers exploring issues regarding the gig economy. Todd Wolfson, co-director of the center, said the grant was for less than $10,000. From October to January — the month the group stopped running ads and also held its first big rally outside California Gov. Gavin Newsom’s office — the group grew its member base, including both drivers and non-drivers supporting the cause, to nearly 3,000. As of March, it had surpassed 3,000 members. >> READ MORE: Should Philly limit the number of Uber and Lyft drivers? This digital organizing technique is being used across sectors, including Organization United for Respect, which connects Walmart workers through private Facebook groups, and the National Domestic Workers Alliance, which organizer Tina Vu Pham said has also found workers through targeted Facebook ads. But they stressed that it’s not a replacement for face-to-face organizing — it’s a starting point, as well as a place to convene workers. In Los Angeles, there are at least 500 people at the picket line at Uber’s Los Angeles hub in Redondo Beach, plus more drivers who have shut off their apps to take part in the strike, which was to end at 1 a.m. Tuesday, Dolber said. They’re demanding that Uber restore the pay cut and instate a $28-an-hour minimum wage before expenses, which is the rate mandated by the minimum wage for New York ride-share drivers. Instate a cap on commissions that Uber and Lyft can take. Allow drivers to challenge deactivations, which happen when drivers receive too many ratings under a certain level. Form a committee of drivers that would communicate with employers Uber and Lyft. Institute a cap on the number of vehicles on the road, as New York has. A “bill of rights” is another strategy that’s being used to win rights for workers that cannot unionize because they are independent contractors, such as domestic workers.